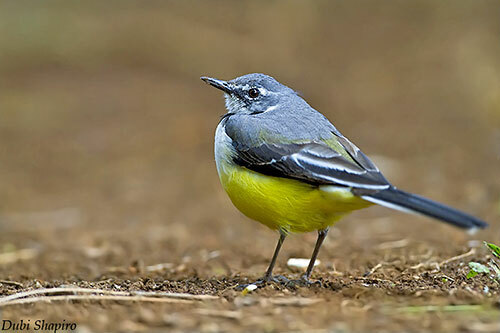 The Madagascan Wagtail is endemic to Madagascar. It is found throughout the island, usually in open areas near water. It feeds on small invertebrates caught while walking around jerkily and wagging its tail. The species is common and widespread, including on the High Plateau. It is not globally threatened and its population is currently stable. 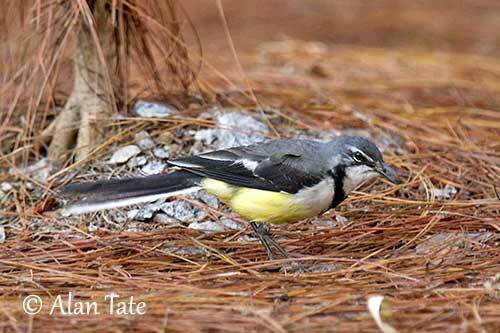 The Madagascan Wagtail adult male has grey upperparts with olive tinge on uppertail-coverts and rump. The wings are blackish-brown with white bases to flight-feathers. The tertials have white fringes. The whitish tips of the greater coverts form an indistinct, pale wingbar. The long tail is blackish-brown with white outer rectrices. The underparts are white with strong yellow wash on belly and flanks. We can see a narrow black band across the breast, ending in a V on the lower breast. On the head, crown and nape are grey with conspicuous narrow white supercilium. We can see a blackish eye stripe, a small white crescent below the eye, and a white spot on the grey ear-coverts. The dark moustachial stripe extends down and joins the breast band on the sides of the throat. The bill is blackish. The eyes are brown. Legs and feet are dark grey. The female resembles male but she has paler plumage. The juvenile resembles female but it has less conspicuous supercilium and breast band. The Madagascan Wagtail occurs throughout the island, but it is most common in E and C plateau, less numerous in N and W, and rare in S were it is restricted to rivers and adjacent cultivated areas. The Madagascan Wagtail is usually found in open areas near fresh, brackish or salty water. 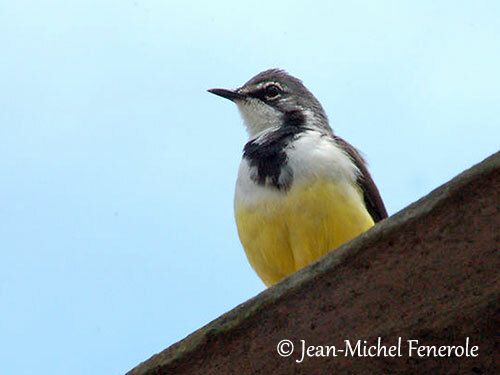 It has relatively broad niche as it is the only wagtail in Madagascar. It can be seen around settlements and in a wide variety of cleared areas away from water such as woodland clearings, secondary forest, plantations and cultivated areas, from sea-level up to 2,600 metres of elevation. 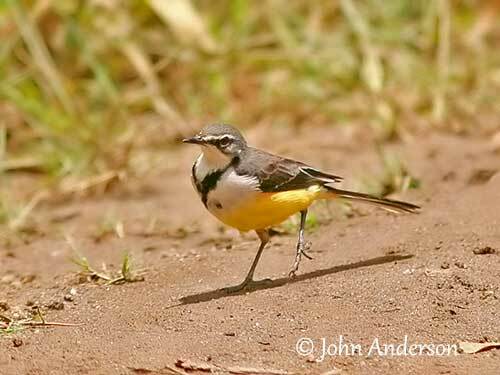 The Madagascan Wagtail gives a loud, melodious phrase “trrree trrree-oou” frequently repeated, sometimes followed by a second phrase “tsee-eee-wee-oo tsee-wee-oo” usually uttered from ground or perch, sometimes in flight and also at nest. The usual call is a loud “tsreee-teeeew” and some variations “teee-tseewew”. 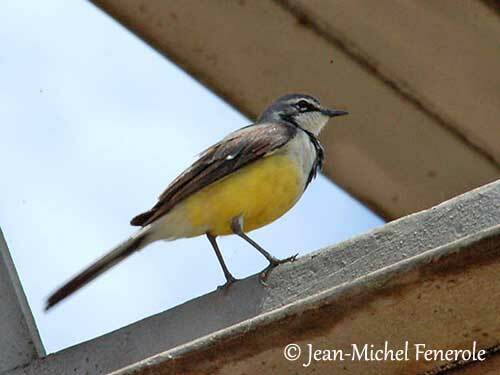 The Malagasy name “Triotrio” refers to the wagtail’s scratchy two-part call “trrree-oou”. 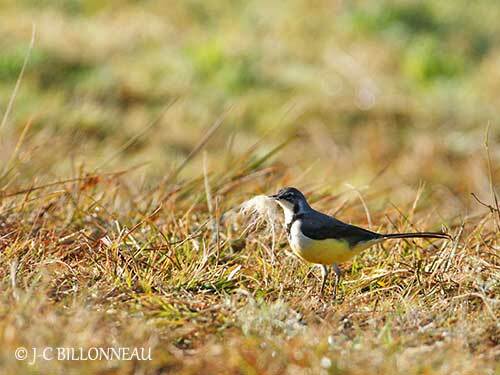 The Madagascan Wagtail feeds on small invertebrates including various insects and spiders. The bird forages by walking around on the ground while typically moving the tail up and down. It may suddenly jump up into the air to catch a prey. The pointed bill is well adapted for picking prey from soft soil or mud while walking or running. It is usually found alone or in pairs, even outside breeding season. The Madagascan Wagtail is probably monogamous. From an observation, both adults share the nesting duties. They are territorial during the breeding season. The courtship displays take place on the ground. One bird, probably the male, walks on the ground while raising its tail vertically and lowering the fore part of the body. It may also raise the wings over its back and stretch the neck upwards and forwards, with the bill in line with the neck. Some similar displays were observed at nest between the incubating adult (probably the female) and the other bird arriving at nest with food (probably the male). These displays were accompanied by complex, melodious song. The copulation starts before the nest-building and usually continues 2-3 days after the laying of the first egg. The Madagascan Wagtail performs some internal movements, mainly altitudinal movements. It leaves the High Plateau during the austral winter, probably to reach lower regions. The flight is undulating and not generally high. The breeding season occurs between August and November. Both mates build the nest in 5-6 days, usually a bulky structure. The cup is made with twigs, stems and mosses, and lined with softer material. The nest is placed in low bush, tree fork, rock crevice, depression in boulder, under roof, but often near or over water. It can be built up to 5 metres high in tree fork, and up to 7-8 metres in crevices in roadside rocks. The female lays 3-4 eggs, usually two. Both adults incubate but the period is unknown. However, the incubation usually lasts 11/14-15 days depending on the species. The chicks are brooded and fed by both parents. Brooding is mainly by female and the male delivers most food to the nest while singing. The chicks leave the nest 15-16 days after hatching. This species produces two broods per season. 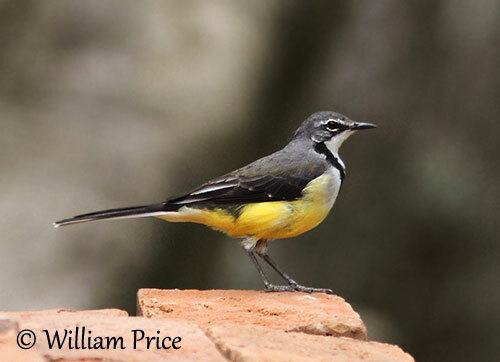 The Madagascan Wagtail is common and widespread, especially in E and on the High Plateau. It may have benefited from human presence as it is often seen around settlements and foraging in artificial habitats. The Madagascan Wagtail is currently evaluated as Least Concern.